Want to explore the web? 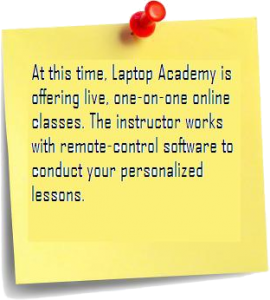 At Laptop Academy™, you’ll master computer basics, speed up your laptop, and take your skills to the next level. You’ll learn on our computers, or on your own computer, in a group or individual setting. Click here to design a personalized computer learning plan. Click here to register for upcoming group classes.